“Nonesuch” is out in Black Static! I’ve been meaning to post this note for a couple of weeks, but weariness at day’s end has constantly gotten the better of me lately. 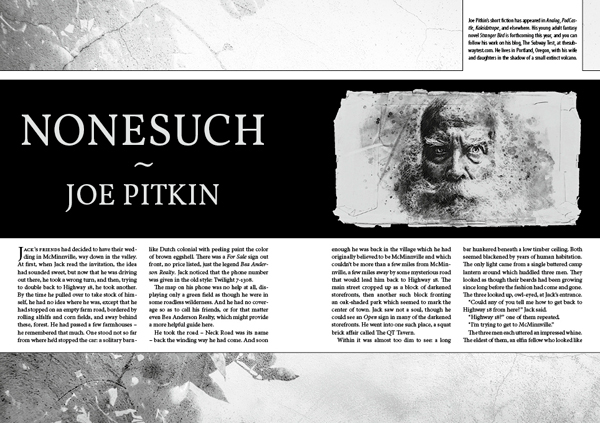 I’m excited to share that my story “Nonesuch” has come out in Britain’s great dark fantasy magazine Black Static. I’m quite taken by the layout, and the illustration is the best I’ve seen of my work. “Nonesuch” is a very meaningful story for me. I set out to write a Bernard Malamud-ian, Marc Chagall-esque collage about my grandparents’ farm in Dayton, Oregon, and what I ended up with was both darker and more frightening than I had anticipated. I realize in retrospect that the story is a meditation on the loss of my brother, my father, and my grandfather, as well as a look at the theft and violence that lies at the root of all land ownership if you dig deeply enough into a family’s history. It was a hard story to write, but I can’t think of anything I’ve written that I feel more proud of. You can pick up the issue at the 800-pound Amazonian gorilla. Hopefully I’ll get the chance to give a reading of the story sometime. I’ve written before about my childhood love of Dungeons & Dragons. When I was 11 years old, D&D transformed me from a kid who loved The Hobbit and the D’Aulaires’ books of Greek and Norse myths into someone who wanted to make his own mythic stories. D&D (and related role playing games like Call of Cthulhu and Paranoia and Traveller: 2300) were one of the few ways I interacted with other human beings during a challenging early adolescence: my friends and I would gather in my dad’s basement to roll dice and shout about spells and orcs for entire weekends, for long, oppressively hot summers. I still feel a twinge of embarrassment when I tell people that I play D&D every Sunday evening. 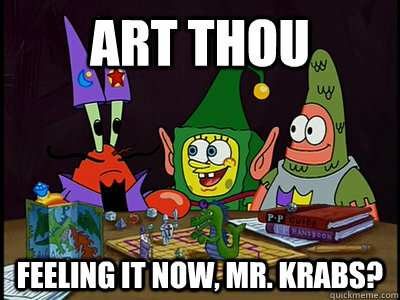 Anytime I mention my adult D&D habit to a casual acquaintance, I fight the urge to explain that it’s not what you think. Thanks to the Internet’s capacity to link the shy and geeky with one another, we celebrate nerd culture today in a way that I could never have imagined when I was 13; however, Dungeons & Dragons has remained a cultural signifier of beyond the pale nerdity. We’re all nerds for something, for Star Wars or Game of Thrones or Fallout, but the ones who play D&D, they’re, well, nerd nerds. Why do I continue to play a game that people typically regard as an obsession for socially awkward tweens? The short answer is that it’s great fun, and I suppose I need no more elaborate an answer than that. But as I reflect on why I still have fun playing D&D, it occurs to me that tabletop role playing games mean something more than nerdly entertainment. Role playing games represent a distinct art form, a mix of fiction and theater and puzzle that is hard to appreciate as a spectator. But when it’s played well–and I acknowledge that D&D is often not played very well–the game can be transformational for participants. D&D is a kind of collaborative storytelling in which each of the participants plays the role of one of the characters. Players choose to a large extent the characters they want to inhabit–their backgrounds, their motivations, their strengths and weaknesses. The Dungeon Master acts as a kind of stage director and omniscient narrator, describing for the characters what they can see and hear, acting out the reactions of the characters’ enemies and friends and environment. It’s a historical accident that these stories generally take place in a Tolkien-esque (some would say highly derivative) fantasy world of elves and dwarves and dragons. Gary Gygax, the creator of Dungeons & Dragons, tried adding a Tolkien-influenced “fantasy supplement” to his tabletop medieval warfare game Chainmail, largely in an attempt to boost his game’s popularity. The first role playing game could just as easily have developed from a science fiction concept, or from Lovecraft’s Cthulhu mythos, or from film noir. It just so happened that Gygax was obsessed with medieval warfare and that his players were Lord of the Rings addicts (ironically, Gygax hated Lord of the Rings–he considered it bloated and lacking in action). The key to Dungeons & Dragons is not the dungeons or the dragons. It’s the idea of a person creating a story whose outcome can only be determined by the others at the table, those people who in ordinary storytelling would be the listeners or the readers. If the Dungeon Master is a good storyteller, and if the players are decent actors–or at least willing to play along with a bit of enthusiasm, the experience is, well, magic.